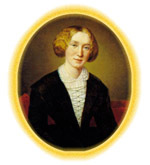 "Review of From Author to Text: Re-reading George Eliot's Romola; Georg" by Caroline Levine, Mark W. Turner et al. Each of these books took me by surprise. There is a curious tension between the incorporativeness of Andrew Thompson's title, George Eliot and Italy, and his compendiously specific sub-title, Literary, Cultural and Political Influences from Dante to the Risorgimento, which somehow led me to expect something like a descriptive catalogue of alleged influences. Instead, I found a book which indeed has awkwardnesses, but which pursues an argument and offers valuable illumination of George Eliot's whole career (and not just Romola, as might easily be assumed). Barbara Hardy memorably observed in 1959 that 'Romola is undoubtedly a book which it is more interesting to analyse than simply to read', an opinion to which I still subscribe after a fashion which has been profoundly qualified by the collection of essays on Romola assembled by Caroline Levine and Mark W. Turner, which added to other work on the novel in recent years makes it impossible 'simply to read' Romola. Levine and Turner and their contributors challenge the whole range of judgments and assumptions about the novel of which George Eliot herself declared 'I began it a young woman, I finished it an old woman'.